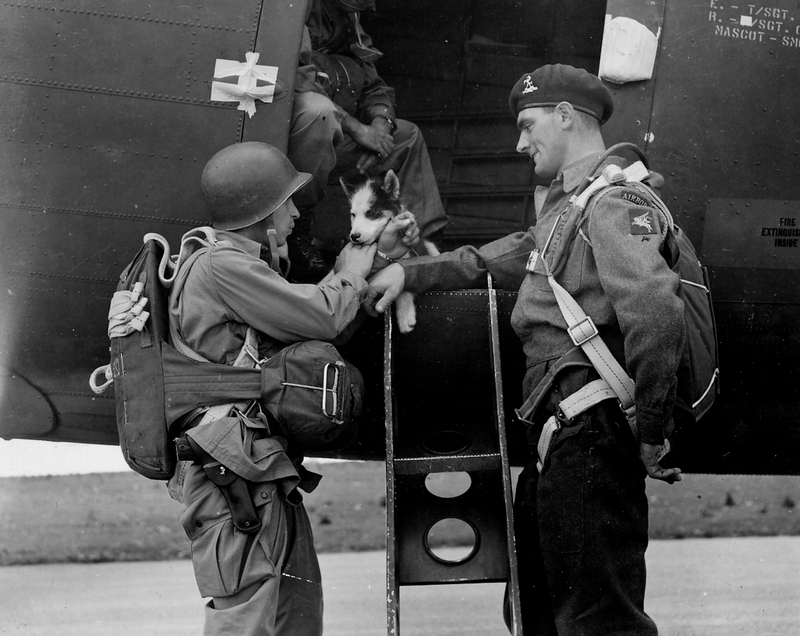 En route to England, the men of the 2nd Battalion, 503rd Parachute Infantry found and rescued this pup, Smokey, seen here in Iceland. The troops brought him to England, and he’s seen here with one of the 503rd’s members as he chats with Lt. John Timothy, the British liaison officer to the 2/503. The 503rd was the first American ground unit to reach England after Pearl Harbor. There is some confusion over 2/503rd’s history these days. The battalion took part in Operation Torch and executed the U.S. Army’s first combat jump. During the African campaign, however, the Army redesignated 2/503rd to the 509th Parachute Infantry. Apparently, the members of the battalion didn’t get that memo until after the war. Meanwhile, a new 503rd Parachute Infantry Regiment was formed and sent to the Pacific, where it joined the 11th Airborne Division and took part in the New Guinea and Philippines Campaign. That 503rd made the jump on Corregidor in February 1945.